Q1. 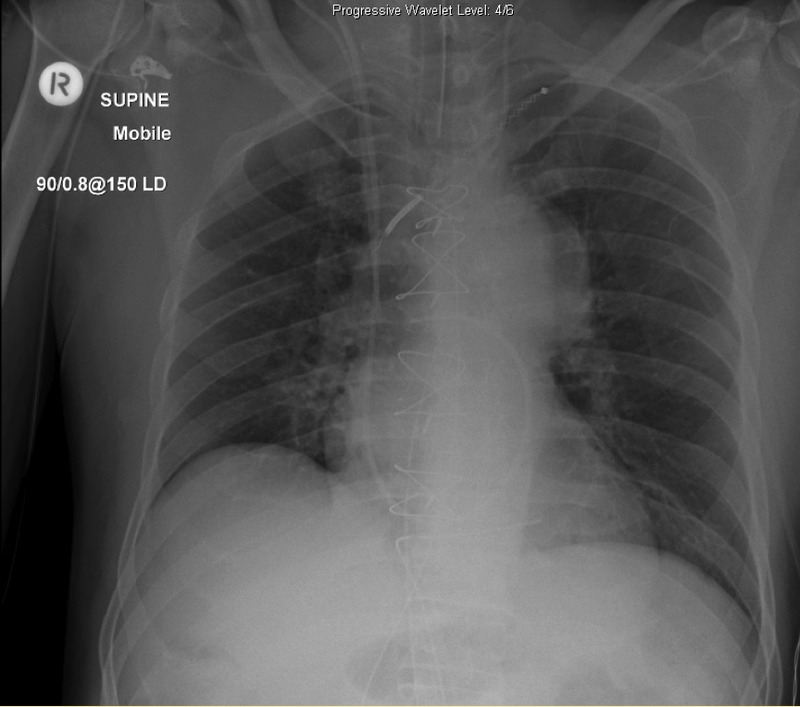 Describe and interpret the chest radiograph. This supine AP CXR demonstrates a correctly sited endotracheal tube (ETT), a left internal jugular central venous catheter with tip projecting over the brachiocephalic vein, a right internal jugular central venous catheter with tip projecting over the superior vena cava (SVC), a Swan-Ganz (pulmonary artery) catheter, and residual pacing wires (with no pacemaker box! ), and a well circumscribed ovoid opacity overlying the aortic knuckle. Q2. Is the position of the pulmonary artery catheter correct? The tip should be curved without loops/ kinks into a main pulmonary artery but not more peripheral than the junction between the medial and middle third of the ipsilateral lung. Q3. What is the significance of the pacing wires? 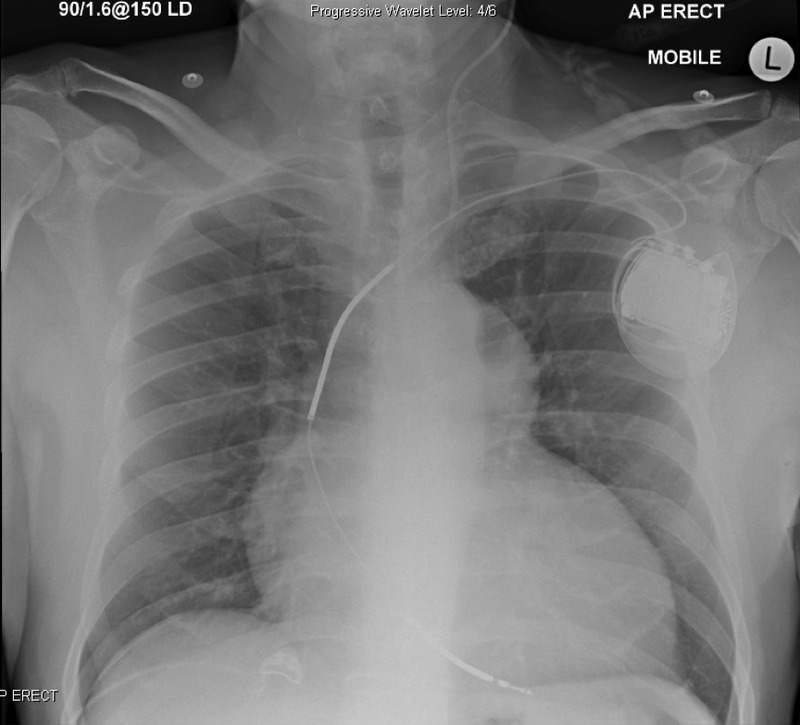 Pre-operatively, the patient had a single lead left sided pacemaker (see CXR below). Occasionally pacing leads break on removing the pacemaker, resulting in retained leads in the chest. Most patients with retained leads have an uneventful course, so further attempts at removal are often not warranted. However, retained pacing wires have implications if the patient should subsequently need an MRI, as pacemaker leads can concentrate the radiofrequency energy resulting in local tissue heating. Retained venous pacing wires can lead to other complications such as thrombosis, infection, erosion or migration (e.g. embolisation). Q4. What is the differential diagnosis of a superior mediastinal mass? The causes of an anterosuperior mediastinal mass can be remembered by using the mnemonic 5 T’s: thymus, thyroid, thoracic aorta, terrible lymphoma, teratoma and germ cell tumours. The ovoid opacity on CXR for this patient is not the aorta as you can see the aortic knuckle and descending aorta separate from this opacity (i.e. the ‘silhouette sign‘ is absent, as the outline of the aorta is still visible). Furthermore, the aorta is situated posteriorly so the mass must be more anterior. 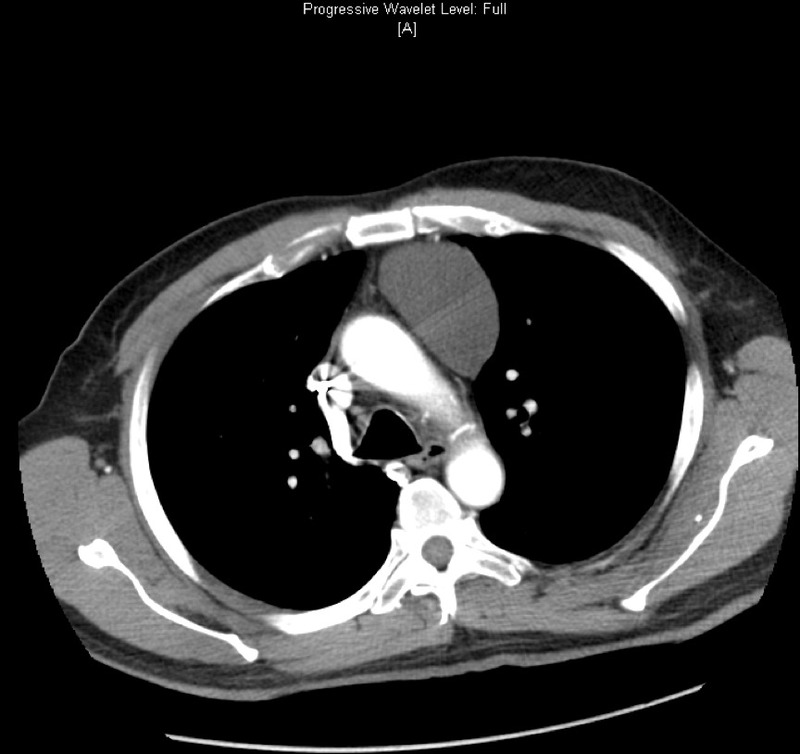 In fact, this opacity was consistent with an anterior superior mediastinal mass demonstrated on a previous CT (see below). The CT demonstrates a well circumscribed homogenous collection measuring 6x5x6.3cm with Hounsfield value of 7HU which suggests a benign fluid collection. This was a long-standing cyst in the mediastinum that existed pre-operatively.